The waiting is finally over - you can now pre-order your brand new iPhone XR. Nearly six weeks after Apple unveiled its latest flagship phone to the world at Cupertino back in September, the day has finally arrived when you can stake your claim for an iPhone XR. That said, you still have to exercise some amount of patience, as shipping doesn't start for one more week. Friday October 26 is the date to circle on your calendar in that regard, and that's when you'll start to see the iPhone XR on the physical shelves of phone and electronic retailers, too. But if you want to be among the first people to own an iPhone XR then you'll want to pre-order it today - demand's likely to be sky high for this one. 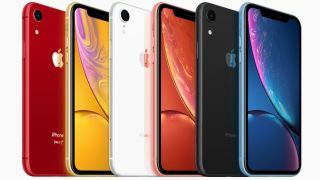 Be sure to check out our dedicated iPhone XR price comparison at the bottom of this page for the early best contract and handset offers. Should I buy an iPhone XR? It's a good question (well asked). If you're on a really tight budget and just want something passable, then the answer is a resounding no. This is a brand new iPhone we're talking about. But if your old contract is at an end and you're dead set on grabbing a new flagship phone, then we reckon the iPhone XR is well worth the money. It's a genuine step up from the iPhone 8, from its aesthetics (it has lost the home button but gained a notch and some fabulous new colours) to the extra processing power that the A12 Bionic chipset brings. Add the 6.1-inch Liquid Retina screen and improved camera smarts, and the iPhone XR is definitely worth a place on your smartphone shortlist. You can read our hands on iPhone XR review to help you make your final decision.